Latin for 'leaves like those of Citrus'. Morinda citrifolia var. bracteata (Roxb.) Hook. 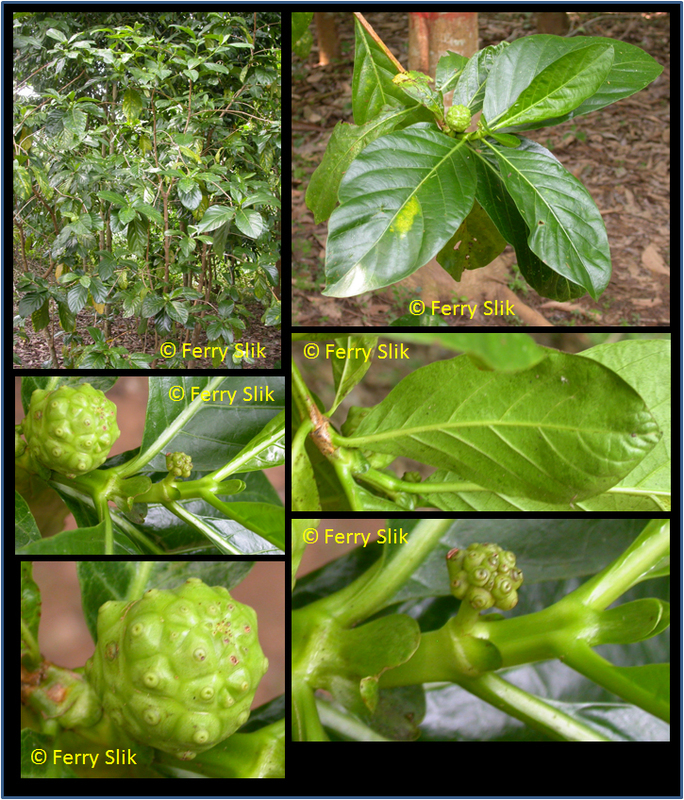 f.
Morinda citrifolia var. elliptica Hook.f. Morinda citrifolia var. potteri O.Deg. Morinda coreia var. stenophylla (Spreng.) Chandrab. Morinda tinctoria var. aspera (Wight & Arn.) Hook.f. Morinda tinctoria var. multiflora (Roxb.) Hook.f. Shrub up to 9 m tall and 11 cm dbh. Stipules ca. 15 mm long, with rounded tip. Leaves opposite, simple, penni-veined, glabrous. Flowers ca. 7 mm diameter, white, with corolla tube, placed in compact flower heads. Fruits ca. 72 mm long, green-yellow, elongate fruiting body consisting of many seeds. Coastal along beaches and in open secondary forests up to 100 m altitude. On sandy soils. The roots and stem are used to produce a yellow dye. The leaves have medicinal properties and are used against tension (place on affected parts), bruises (place on affected parts) and as an antidote against blowpipe poison. The fruits are edible. From Sri Lanka and India to southern China and Japan, throughout the Malesian region and into the Pacific and Australia. In Borneo collected in Sarawak, Sabah, West- and East-Kalimantan. Borneo: Bamkoro, Bangkudu, Bangkuru, Bengkal putih, Bingkuduk, Engkudu hutan, Mengkudu.